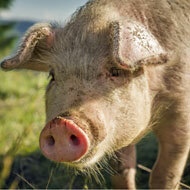 The NPA has issued a call to the Government to review its outdated feral pig plan. The National Pig Association (NPA) is urging farmers to warn the public about the risk of feeding pigs. The call comes in response to the increasing risk of African Swine Fever (ASF) entering the UK. The disease is currently spreading throughout Europe and has also been identified in China. People feeding pigs infected meat, either deliberately or accidentally, is thought to be one of the most likely ways for ASF to reach pigs. It was also identified as the most likely cause of the 2000 swine fever outbreak. “We know there are many ways the ASF virus could get into the country, so it is absolutely critical that the pig industry takes all the precautions it can to keep it away from pigs,” said NPA chief executive Zoe Davis. Another likely way for ASF to enter the UK is through wild board eating contaminated meat either fed or discarded by the public. To help prevent this from happening, the AHDB has launched a social media campaign to #KeepWildBoarWild. The campaign stresses that while feeding wild boar might seem helpful ‘it can be dangerous for their health and spread diseases that affect all pigs’. It cautions that boar soon become used to being fed and may then venture into local towns, wreaking havoc on the roads and raiding bins. The NPA has issued a call to the Government to review its outdated feral pig plan and take more responsibility for the management of the UK’s increasing population of wild pigs.